On 8th Feb, the first day of the new semester in Sanya Shuangpin Primary School, many parents and students were attracted by a new school bus, the first school bus in China that is in accordance with the new national safety standards. 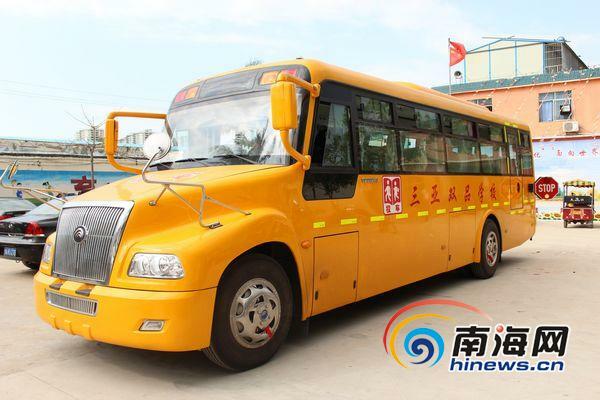 The yellow school bus was ordered from Zhengzhou Yutong Bus Group. It was specially designed and developed in accordance with stricter safety standards. The new school bus is 10 meters long, with a capacity of 50 seats. It features an American-style ‘long-nose’ design, which can absorb impact energy to a maximum extent and provide the driver and front-seat passengers more protection in a head-on collision. The front engine design provides more safety for students. When crashing in front, it can effectively reduce the power. And the school buses are over one meter above the ground, and this can ensure safety of students with side crush with cars. Shuangpin Primary School has ordered three such buses, and plans to purchase three more within this year to ensure better safety for students, according to the school authority.